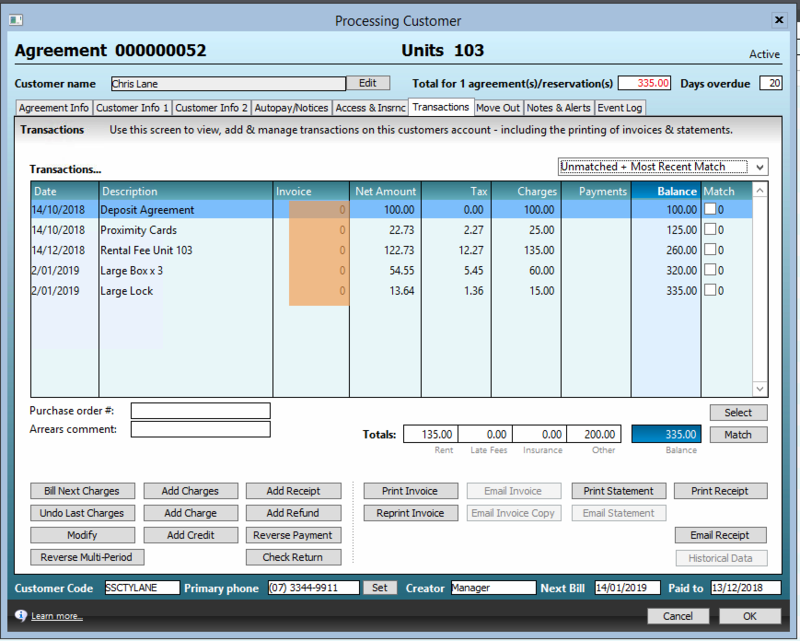 Charge transactions are locked to an invoice, using the invoice number. Once generated, it is only possible to reprint a copy of the invoice. 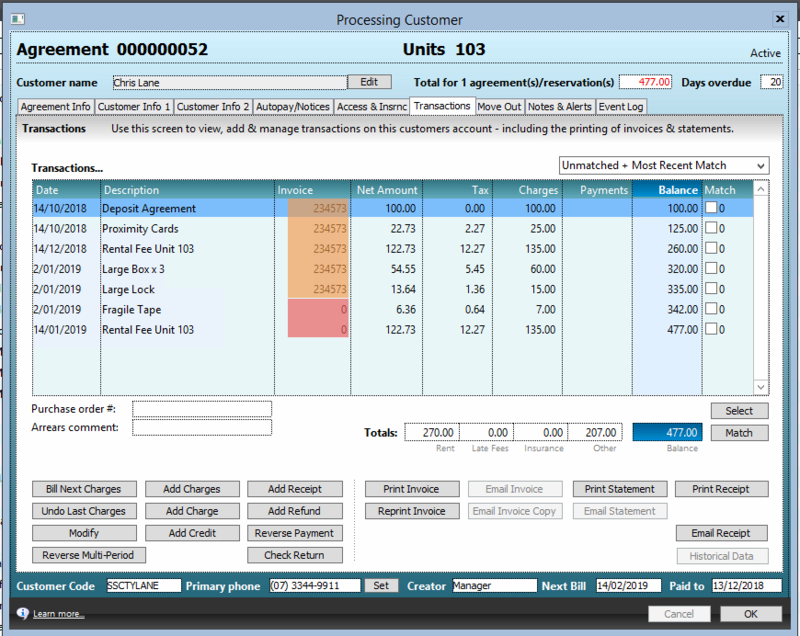 Payments/receipts are no longer shown on the invoice, only charges. If you are changing to this invoice system, Statements are recommended to be sent to your storers as well as invoices to assist in the transition. Your storers may find it confusing that they are no longer seeing their payments on their invoices. 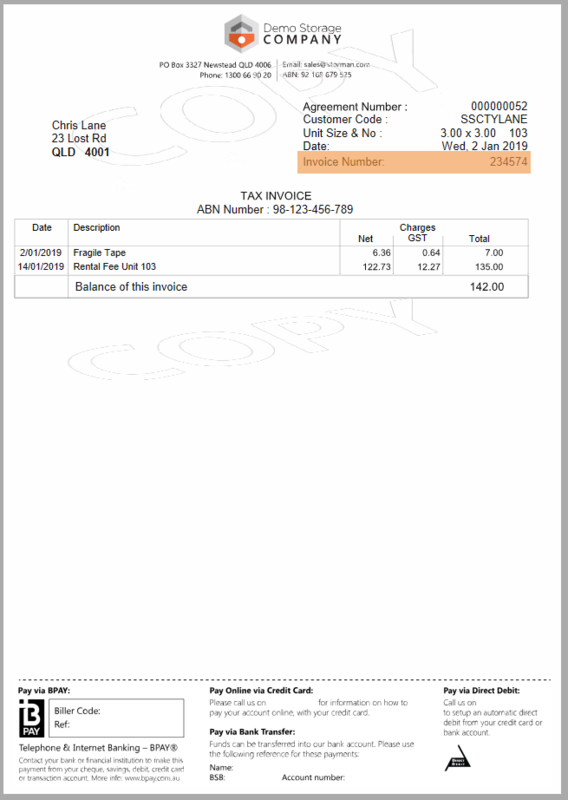 Below is an invoice printed from Storman using the Combined Invoice System. 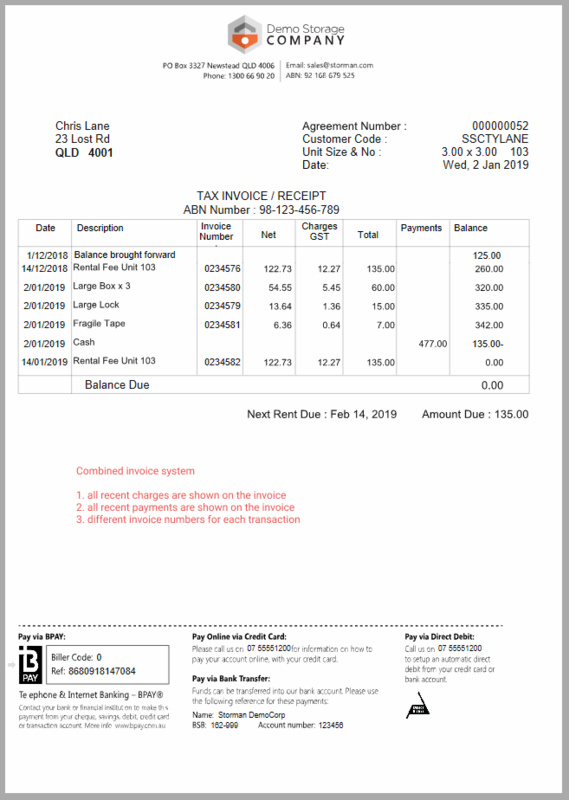 This invoice acts as a customer statement, and shows all transactions (charges or payments) from either the customers last bill date, or the first date of the last month. 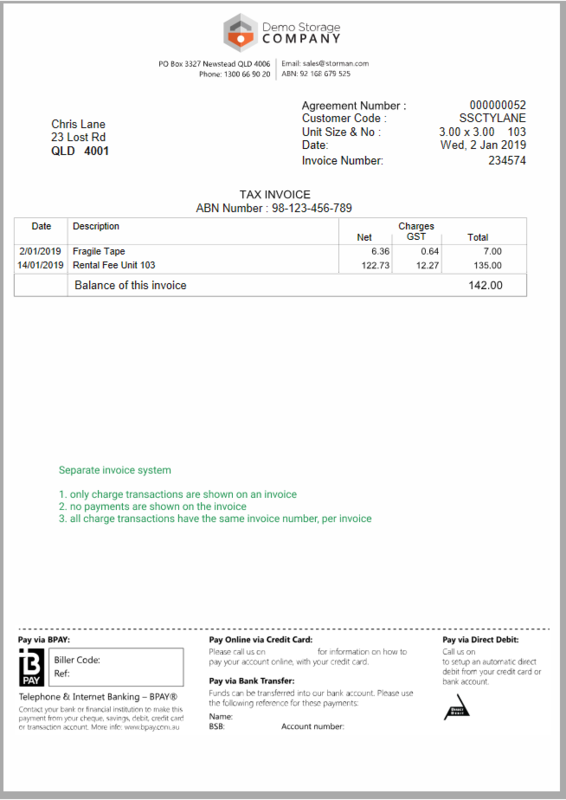 Below is an invoice printed from Storman using the Separate Invoice System, this invoice only shows certain charge transactions. Each group of charge transactions is locked to the invoice they were printed for. Adding charges to a reservation or agreement can be done using the ADD CHARGE, ADD CHARGES, and/or BILL NEXT CHARGES buttons. These charge transactions will be created with an invoice number of 0, which means it has not yet been invoiced. 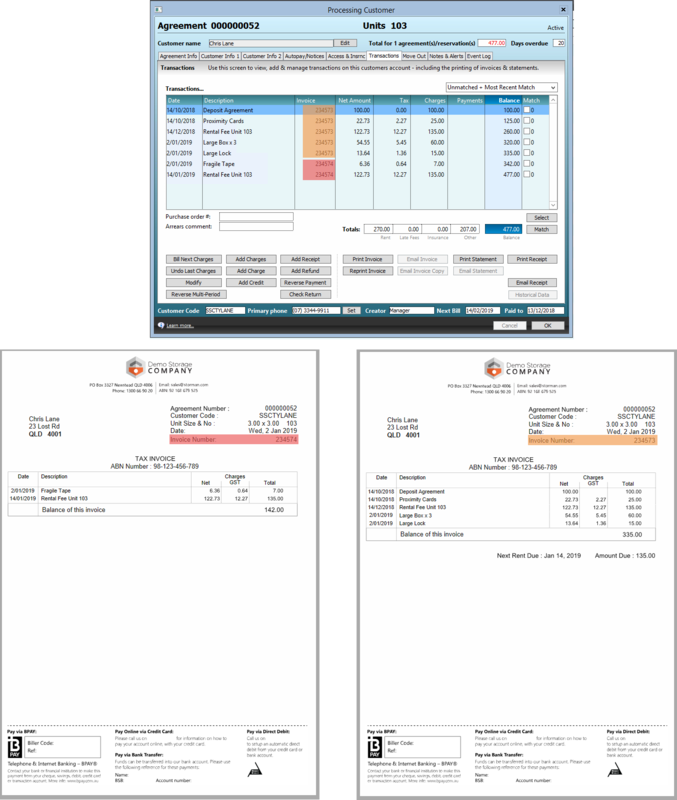 When printing or emailing a new invoice, Storman will include all charge transactions for the reservation or agreement that have not yet been invoiced, (invoice number 0). 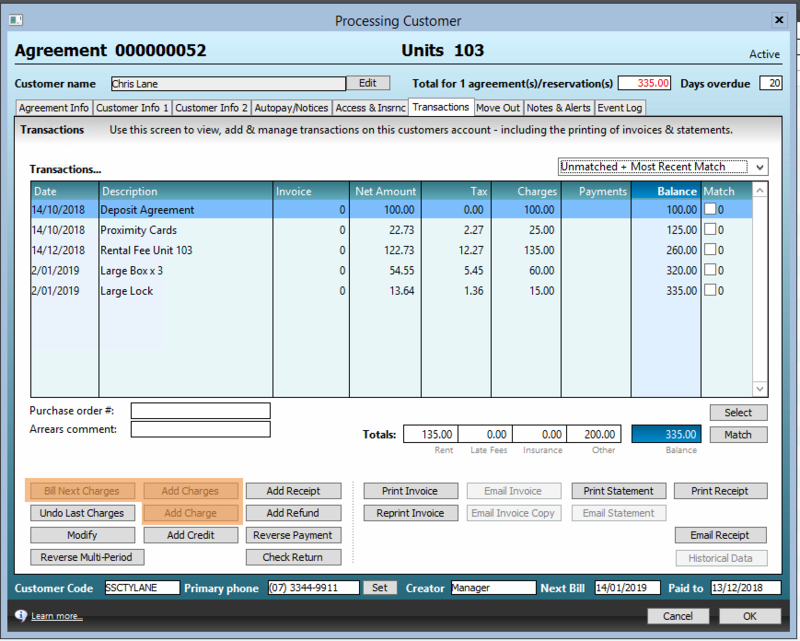 After printing or emailing this invoice, these charge transactions will be given a unique invoice number and will not be shown on any other invoice created for this reservation or agreement. If needed the reprint function will need to be used to print a copy of this invoice. As you can see in the below example, Chris Lane has already been invoiced previously in orange 234573. He has now been billed his next month's rent and purchased a roll of fragile tape. 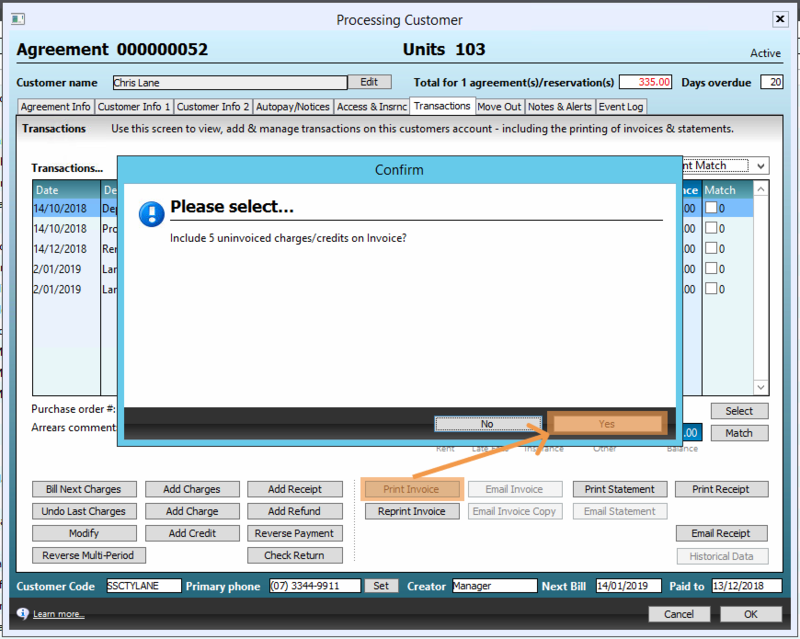 When clicking print or email, these new transactions will be shown on a completely new invoice and they will be assigned a new invoice number. 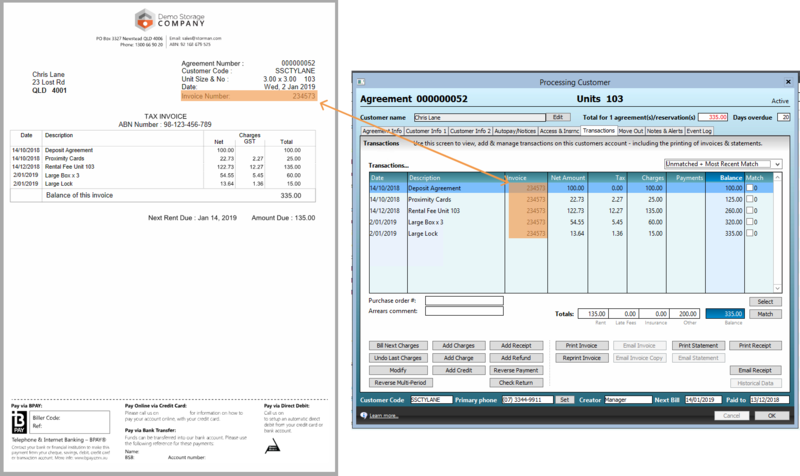 Example below of two invoices, for different charge transactions. 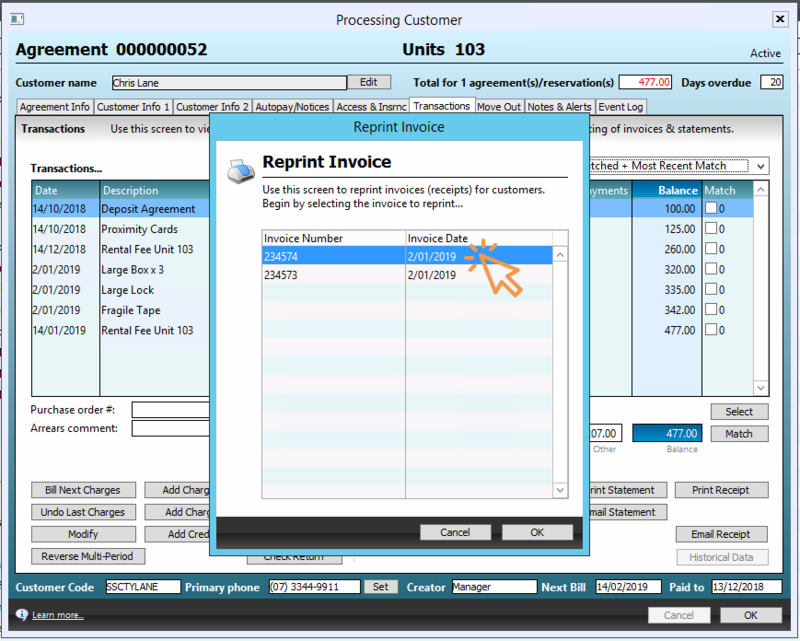 To reprint a copy of a previous invoice for an agreement or reservation, use the an REPRINT INVOICE or EMAIL INVOICE COPY buttons. 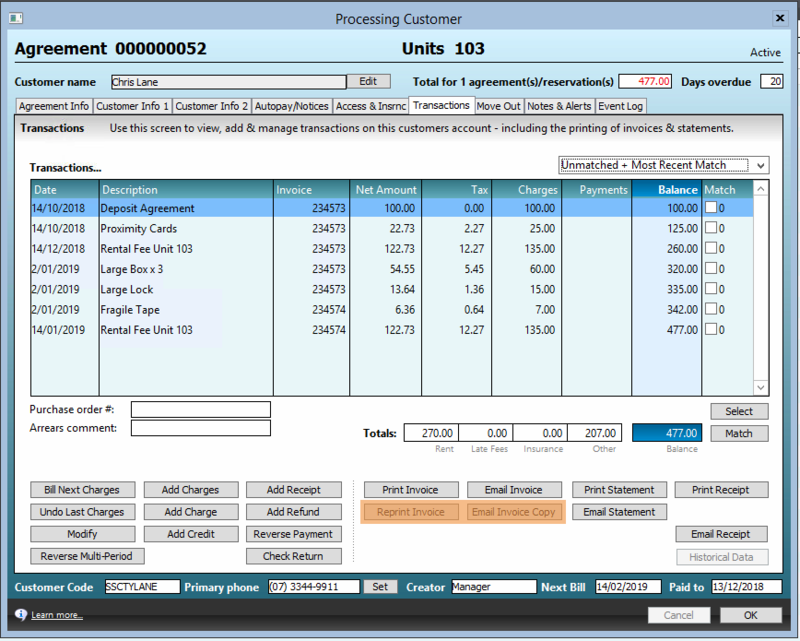 Storman will ask you which invoice (using the invoiced date and invoice number) you would like to reprint. 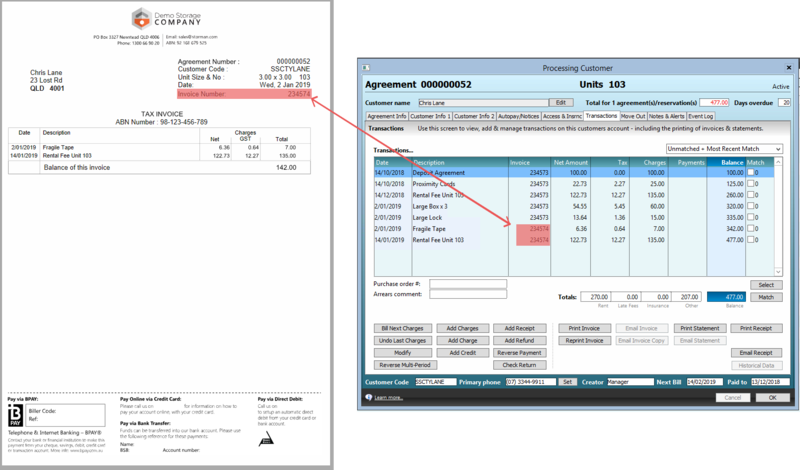 Highlight the invoice you would like to reprint/re-email and click ok.
Storman will create a copy of the invoice, showing only the transactions that were generated at the time for this invoice. The PDF will also have COPY watermarks across it, to indicate that this is not an original.